Are you looking for an easy healthy recipe that’s also gluten free? Look no more. 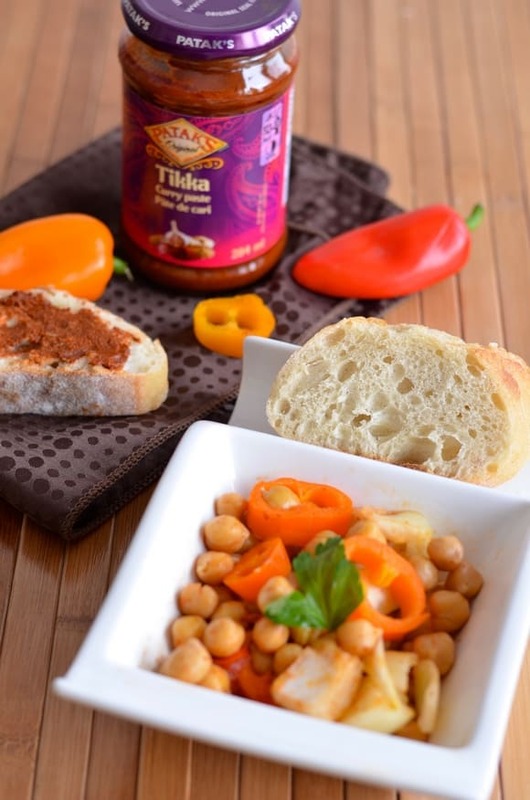 Try this chickpeas salad recipe with Pataks’ Tikka paste. I am sure it will become a staple in your home. With Celiac Awareness Month around the corner, I wanted to show my support to those who stick to a gluten free diet.. My family does not suffer from this disease so I had to make sure of the gluten free products in my recipes. Thankfully, all Patak’s Canada products in Canada are gluten free, I figured I could use them safely in my salad recipe. I tried the following Chickpea curry recipe from Patak’s Canada website. Nothing like a salad recipe to welcome spring, right? Don’t worry, spring is on its way. I think if I send positive thoughts and prepare springish recipe, it will come faster. 1 green chilli pepper, cut lengthwise in half. I used colored peppers. Heat vegetable oil in a frying pan over medium high heat. Fry the onions for 5 – 6 minutes, until soft. Add the Patak’s Tikka Paste and the chopped tomatoes, reduce heat to medium, and cook for another 5 – 8 minutes. Add the chilli pepper and chick peas. Cook for another 2 minutes. What do you think? Doesn’t this gluten free recipe look delicious. It really is. To spice up things a bit, I even added some Tikka paste to my baguette. I love spicy food and I enjoy toasted bread with hot spreads. Looking for more delicious ways to spice up your gluten free living? 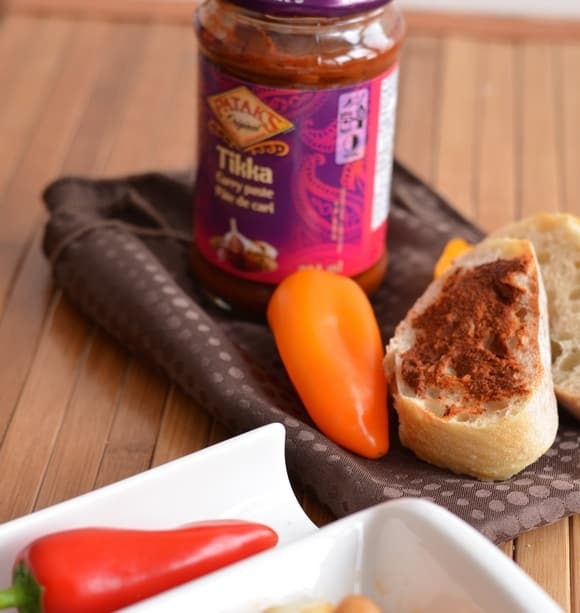 Check out the Patak’s Canada website for all their yummy products. Don’t miss their amazing Tumblr, Good Korma! So many delicious recipes there. Follow on Facebook and Twitter to keep up with all their exciting news. This salad recipe is perfect for lunch, as it’s rich in protein. It is also perfect as an entree for your fancy dinners. It is colorful and looks fabulous on your table! Have you ever made a gluten free spicy chickpeas salad recipe? Tell me about it in the comments! i LOVE ALL KINDS OF SALADS. So I think that I would like this one also. Thank you for the recipe. 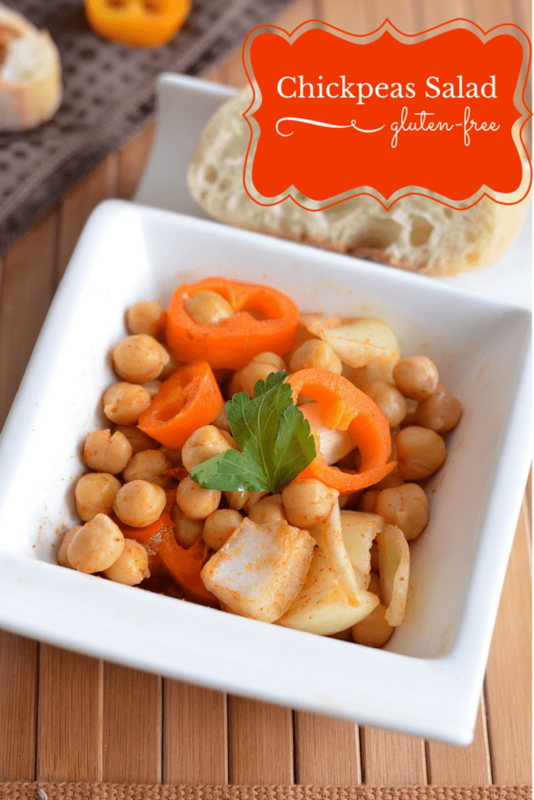 I really like chickpeas and curry and so I am going to make this…Pinned for later! What a great idea! thanks. That sounds like a delicious salad. I love chickpeas and spicy food. I have never made and never heard of this salad before. It looks pretty good! I love chickpeas but only have one recipe for them. Now I have two. I look forward to trying this recipe, it looks and sounds tasty. What a great summer salad for my gluten free friends! thanks! This salad sounds awesome. I grew up eating something very similar called chana chaat. I love chickpeas, or garbanzo beans as my family calls them. I’m sure this salad is tasty! My family loves chickpeas. I am going to get the ingredients and make this on the weekend. I know they are all going to love it. I have never eaten chick peas before but this recipe sounds amazing! I love the look of that chickpea salad. I’ve never heard of Tikka baste. I’d def. try it though> And I do love chick peas. I’ve never had whole chickpeas, only ones in hummus. This sauce looks delicious. Think I might go buy some. I have always loved chick peas. My grandmother makes a family recipe that she puts them in and it is delicious. I bought Chickpeas to try them out, 3 months ago. I’ve had Hummus, which I know has Chickpeas in it- but for some reason I just can’t make myself open the darn can of Chickpeas sitting in my pantry! This recipe gives me a reason to finally open them and try them out! My husband would be all over these spicy chickpeas. Now that I’m on this 8-week challenge to lose weight I’m always looking for healthy options for us. Now this is my kind of salad. I love spice and I love chickpeas. I’ll need to make this for lunch! This looks nice. I really enjoy chickpeas so this is a great treat. I have never tried chickpeas suprisingly! I would love to try this salad recipe! My daughter is gluten free and can get pretty bored with the same old foods. She would love this so I’m going to pass the recipe on! I have never had a chickpea! They are beans right? I love beans so I need to just try them. That sounds like a delicious salad. I love chickpeas. Sounds like a tasty and easy salad. Thanks for the recipe. Which Side of Effects of Vaccines Should You Worry About?